Description: Cap 4 to 11 cm, convex, nearly flat at maturity, smooth to uneven brown to blackish-brown, velvety, possibly a whitish bloom when young. Pores small, pale yellow to yellowish-green, often (but not always) bruising blue. Stem 4 to 12 cm long, 1/2 to 3 cm thick, dry, solid, smooth, yellow or tan, with red granules or flush. Smell and taste mild. Spore print olive-brown. Habitat: Scattered on ground in coniferous forests, fall. 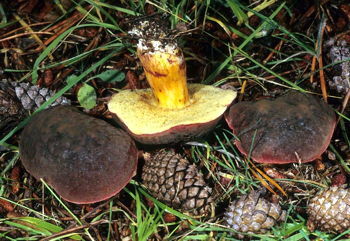 Primary keys: Brown to blackish-brown velvety cap; pores slowly staining blue; red on stem; grows on ground. Edibility: Fair. Not particularly notable, but sometimes fairly abundant. Note: This is an elegant mid-fall bolete that is easy to identify. Its cousin — B. mirabilis — looks very similar, but always grows on wood. Another cousin — B. chrysenteron — is virtually identical, but has a somewhat lighter cap with cracking in the velvet and less red on the stem. Older specimens are frequently infested with larvae. In a medium skillet, heat 2 T. oil. Add the garlic, mushrooms and thyme and cook over medium high heat, stirring occasionally, until the mushrooms are dry, about 5 minutes. Stir in the flour, cook for a couple more minutes, then add the stock, soy sauce and sherry and stir constantly until a smooth sauce forms. Simmer over moderate heat, stirring a few times, until thickened, about 3 minutes; season with salt and pepper. Cover gravy and keep warm. In a small bowl, mix the kasha with the beaten egg. Be sure all the grains are covered with egg. Place a medium non-stick frying pan on medium heat. Add the kasha to the pan and, using a wooden fork, flatten it out a bit, stirring and moving it about the pan until the egg dries and the grains have mostly separated. Set aside. Boil the bow tie pasta in salted water just until tender. In a 4-quart heavy stove-top covered casserole, heat 2 T. oil and saute the onions until clear. Add the stock and bring to a boil. Add the salt and pepper and the reserved kasha. Stir a bit and cover. Cook over low heat, stirring now and then, until the kasha is tender, about 10 minutes. Drain the pasta, stir into the kasha, turn out on serving platter and top with mushroom gravy. Note: Virtually any mushroom except firm/crisp types will work.